Soft tissue lasers are the new, improved tool for gum contouring, tooth reshaping, and soft tissue treatment. Dr. Puig has been using soft tissue lasers in our Orlando dental office for many years, and finds it to be the least invasive method resulting in the best outcomes for her patients. Laser dentistry was declared safe for the public by the FDA in 1990. The use of soft tissue lasers makes procedures less invasive than traditional methods, as there isn't residual damage to the surrounding tissue. Most of our patients report little to no discomfort during or after treatment! At Dynamic Smile Design, we offer the latest dental technologies. Read on to discover how medical lasers improve your dental care! Less time in the dentist's chair: Procedures performed with soft-tissue lasers can often be completed in one visit, and in fewer steps. Better patient comfort: Patients report little or no pain during or after procedures using the laser. Most patients resume their normal activities quickly following laser surgery. Improved results: Lasers can provide benefits that didn't exist before. For example, they can often detect cavities at earlier stages than other technologies. Lasers can be used to directly treat infection that would normally be difficult to address, such as fever blister removal. Less invasive: The soft-tissue laser replaces a scalpel in many procedures. This also means no stitches are needed for proper healing. Almost no bleeding: A laser self-cauterizes incisions, causing them to close quickly with very little bleeding. These incisions are less likely to bleed following the procedure as well. Faster healing: Procedures that require cutting and stitching, such as traditional gum recontouring, can take weeks for complete healing. With a laser, this time is reduced to days. When used for removing canker sores, patients will notice improvement immediately. 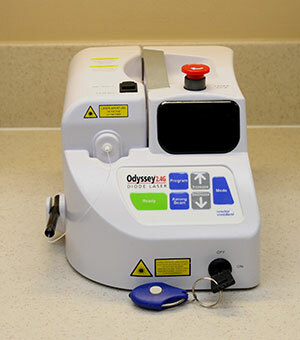 Reduced risk of infection: Since there are no open incisions, less bleeding, and faster healing, procedures done with the laser present less of a risk of infection than other methods. If you would like to learn more about laser dentistry, contact us and ask for a consultation with Dr. Puig.